One of the biggest areas of improvement in this version is the addition and update of the various shaders that are available in Houdini. The push is towards making the materials more physically plausible right out of the box. The big addition is the new Principled Shader which is based on the Disney Principled BRDF Shader. This is an excellent shader that lets you build a majority of materials with a minimal set of controls. It is also compatible with the PBR metalness and roughness workflow, so if you are used to painting textures and building shaders with Substance Painter or Substance Designer then those shaders and maps will work perfectly with the Principled Shader. The shader also has a built-in secondary coat layer that makes it fairly simple to set up layered shaders. Even the base Mantra Shader has been updated to be more physically accurate. There is a new metallic reflection and edge tint parameter which allows the user to easily create metal and also now by default the fresnel blending is on, to give a more natural reflection falloff. In order to support the new PBR approach, SideFX now provides a library of royalty-free PBR ready textures that are available for download for free from their website. Also in the bump map setting in both the Mantra Shader and the Principled Shader the user can set different bump maps for the base layer and the coat layer. So if you want the base layer to be distorted using a bump map and the coat layer to be clean then this is now possible. Beyond this, Houdini now has a bunch of custom shaders which include, Car Paint, Brushed metal, Glass and also a custom Skin shader. There is also a new Toon shader available. All these shaders are now precompiled Digital Assets, which makes them load faster in scenes where there are a lot of materials. If you do wish to see their node structure, then you need to unlock the Digital Asset, otherwise the node structure is invisible. Along with this, within the Shader Builder you now have the ability to layer shaders ,which also makes it easier to build more complex materials. Houdini has also updated the base PBR nodes, such as the PBR Diffuse and the PBR Specular. The PBR Specular now has a built-in Fresnel, so it’s much easier to set up. Since these nodes form the basic building blocks for any shader, making them more fully featured makes the user’s life simpler when you want to build custom shaders from scratch. To use custom built shaders, Houdini provides a new Layer Pack node, which gives the user a layer output to add it to the layer mix node. At the texture level, there is a new Displace texture, which has built-in support for bump, normal and vector displacement. There is also a new map which can convert bump maps to normal maps. For volumetrics the Pyro Shader has been greatly simplified. All the most commonly used parameters are now in one tab and the stuff that was rarely used has been removed in order to streamline everything. At lighting level, lights by default are set to physically correct attenuation giving them a much better falloff. There is a new Exposure parameter and the user can now create a light based on the current view and it also automatically sets the light intensity. Along with this there is a new tube light option. Houdini also now ships with a whole bunch of IES files for more custom light profiles. On the rendering front, there are several minor but important improvements. The IPR window now shows elapsed and final render time along with time remaining and memory usage. A new feature called Checkpoint has been added, which lets the user restart a render. So if you stopped your render mid-way for some reason then it can be restarted. For this the file has to be stored in either Mantra’s native image formats namely .pic and .rat or saved to OpenEXR. 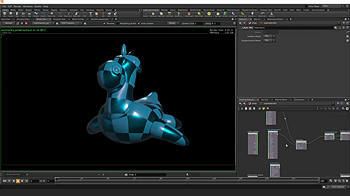 In Mantra, there are new quality controls for Diffuse, Reflection and Refraction. These act as global multipliers on top of the already set sampling values. These parameters can also be set on a per object level. So if you just want to focus additional samples on particular object, then that can be done, too. Houdini has added a brand new Bake Texture node. This node will allow the user to bake a variety of textures including Occlusion, Cavity, Thickness and normal maps. You can also bake out the final shader to texture. Finally, Houdini now supports Renderman 20 and RIS shading. There are built-in Renderman lights and shaders and the user can also build custom RIS shaders in the shader network. However, these are only available in the full Houdini version and not in Indie or in Apprentice, since those two versions do not support third party renderers. The only thing that I can say in conclusion is that even though this version was released barely nine months after the release of Houdini 14, it’s impressive how many new features have been added in such a small time frame. I am especially happy with the improvements to the modeling toolset, and being someone who enjoys lighting and shading, I can say that the new shaders are really impressive and make the overall shader building process a lot simpler. The enhancements to FLIP fluids and POP grains are great for VFX artists who deal with very large simulations and the new viscous tools allow the user to set up viscous fluids very easily. Overall this is an excellent release. Rohan Dalvi is an India-based CG artist with nearly 18 years of experience working in projects ranging from Motion Graphics, Architectural Visualization to VFX for films. He enjoys doing anything creative but what he likes most is to teach. He has been a trainer for almost 12 years and he currently makes training videos for Houdini. To see his work visit www.rohandalvi.net. Fluid surfacing and layered shader images are property of Side Effects Software. All other images are property of Rohan Dalvi, provided courtesy of the author. Yeah just wished attributes and looping wasn’t put into Modeling description. I would pay for your tutorials on Youtube if you created a subscriber $$ only channel. Thank you! I don’t have a subscriber channel on YouTube. I’ve never been asked about that so far. I’ll definitely look into it. However , all of my training is available via gumroad and all the content , upon purchase , is downloadable. Could you kindly tell me why you would prefer YouTube? Not to talk badly about his request, but Youtube streaming doesn’t make sense at all. Gumroad, Cubebrush, even Steam are better options (in my view). What you could do is a vimeo on demand, that works well. THU has it. You can make it like a rental for a period or just buy and own forever. I am eyeing your Gumroad tutorials. Do you plan to do a ” I am new to 3d and houdini” level of tutorial series ( like how 3dbuzz’s jason Buzzbee had done way back ? (I switched to Houdini after 16 years of 3dsmax, and that tutorial there was very nice to have. ).